While writing blog posts about historical motorcars (Click here for Parts One, Two, and Three) this summer, and preparing for my recent trip to archives in Alberta in July, I did a lot of searching and browsing through the University of Alberta’s extensive digitized collection of historical postcards on Peel’s Prairie Provinces. Here is but one of the intriguing images I found. First Car in Canada (1898) Still Going Strong. Owned by Chas. Jackson, Calgary. Courtesy of Peel’s Prairie Provinces. 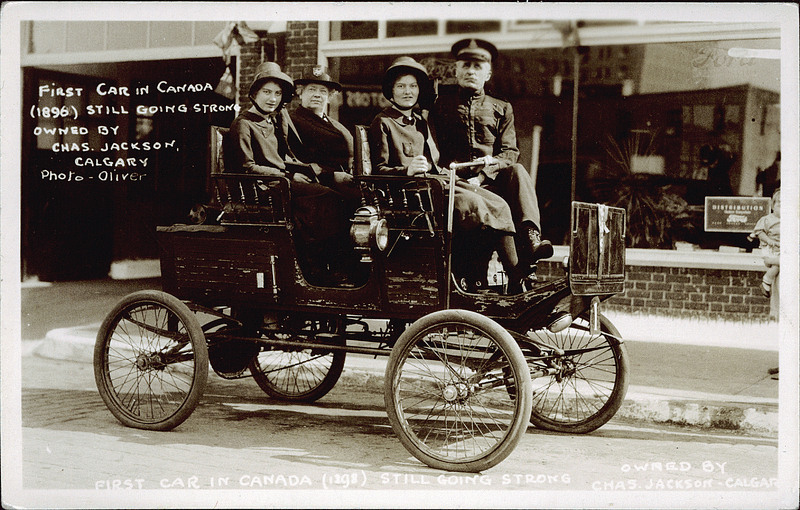 Judging by the “still going strong” caption on the front, one could assume that the vehicle was old even at the time that this postcard was made. I would guess that this picture maybe even dates to the mid- to late 1920s. The road is also paved, which was rare in many cities in the west until the 1930s. Or perhaps it is a cobblestone road? The flags behind the heads of the two passengers in the back appear to be red ensigns, which were of course the official flag of Canada until the adoption of our current flag in the 1964, but we already knew that this photograph predated the 1960s. Incidentally, the vehicle itself is fascinating. You can really see the influence of bicycles in the design of this automobile, particularly in the wheels. Look at those spokes! And the chain! The shocks also look like they come from a Victorian carriage. Note, too, the dashboard – a little shield – and the fact that the steering wheel, strictly speaking, is more of a rudder than a wheel. All in all, a fascinating glimpse into early motor history in Canada.